I’m excited to be contributing to The Bridge, “an artistic interrogation, exploration and celebration” of Canada 150 by a whole gang of Fredericton artists. Spearheaded by local theatre company Solo Chicken Productions, the project is part art installation, part historiographic jam session. 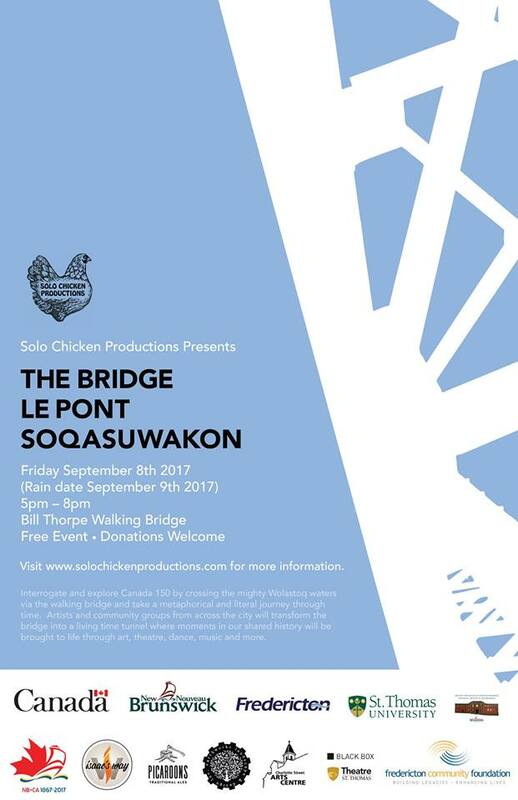 On the evening of Friday, September 8th, Fredericton’s Bill Thorpe Walking Bridge will be converted into living time tunnel, and the public will be invited to pass through artists’ interpretations of various moments, events, and encounters in Canada’s history. I’m honoured to be collaborating with Wolastoqiyik artist Natalie Sappier-Samaqani Cocahq on a new performance piece on the theme of Reconciliation, and I look forward to sharing more details of our work as the event approaches. Stay tuned!